This March, 460 KBF Members will launch rigged-out watercraft on Louisiana lakes and streams, chasing the title of 2019 KBF National Champion. Each competitor will stand or fall on the basis of his own performance—the product of his experience, knowledge, capabilities, gear, and preparation. Sixty of those National Championship Competitors, in sets of five, will tally up their Day 1 and 2 big bass scores in a bid for the TEAM CHALLENGE CUP TOP TEAM CHAMPION title. Individual and team competition. Together, in the same event? If possible, is it fair? How can any angler compete solo against others who are members of a team? We believe it is both possible and fair, if done right. “Doing it right” what we’d like to address in this post. More bass anglers each year are attracted to competitive kayak bass fishing by the threads of generosity, friendliness and integrity that are woven throughout the fabric of this community. We enjoy the camaraderie of our club get-togethers, of tournament captain’s meetings and awards ceremonies, and our interactions in social media groups. And we treasure memories of time spent with others on and off the water who share our passion for the sport, our enjoyment of competition, our appreciation of nature and regard for our fisheries, and respect for each others’ rights and privileges. Communication between competitors, cooperation among contenders; these drew us in. Sharing intel and tactics, rigging tips, water and fishing lore; what else are four KBF Members going to do on a 2,400 mile road trip, over roadside diner meals, lounging on the cabin porch or while spooling up reels in a hotel room? 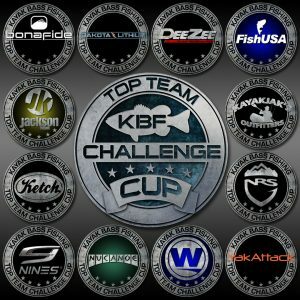 Competitors who fish together all year, who pool their money, travel together, and share the KBNFC experience are as much a team as any in the KBF Team Cup Challenge. Communication and cooperation are second nature in all those relationships. But one doesn’t have to be on a team or from the same kayak fishing club or share a lake cabin to communicate and cooperate. One fisherman may be doing his best to out-fish another kayak angler he encounters alongside a steep, rocky bluff, but if he notices the other struggling or in need of assistance, it’s rare for one of us to pass by without a friendly greeting or suggestion. Many times he will end up digging through his gear and offering the other what he need to compete more effectively. We’ve seen this too many times to deny it happens…a lot. Cooperation is the norm for kayak bass fishing. The sixty anglers selected for twelve KBF Top Team Cup Challenge Teams aren’t just expert fishermen and formidable competitors. They exemplify what’s best about the whole kayak bass fishing competition experience. While putting forth great efforts to achieve victory, we’d be astonished to learn that any one of them would seek undue advantage over their competition. We expect them to communicate, to cooperate, to share tackle, offer advice, and lend a hand to their teammates—just as they would any other competitor in the National Championship. So what’s the issue? We believe that communications and cooperation need not cross the line into collusion, complicity or conspiracy—though it’s possible. The problem is, there’s really not a line. Not a distinct one, anyway. It’s more of a smudge, and there are no sign posts to warn that one is approaching it or in danger of crossing over. If a group of Championship competitors—Cup Team, fishing buddies, club members, whatever brings them together—plan to work together as a unit during competition, testing different patterns, locations, and strategies, coordinating their efforts and movements, working in concert to aid one or all to achieve greater results, they’ve plainly crossed the line. We trust that none heading to Shreveport over the next week will. The line is vague, and that makes many uncomfortable when money is on the line. With the line not being a distinct, DO NOT CROSS, there will certainly be perceptions and feelings that make some suspect. We understand and acknowledge this so we are appealing to a greater sense of integrity in hopes that we can preserve our methods of competition, now and in the future. The best advice we can give is this: Act honorably. Do your own work. Earn your own victory. Make sure you compete in such a way that when you hold up that big check onstage, you can hold your head high. Joke, chat, share, serve and enjoy the Championship experience and the camaraderie of other anglers. But if you find yourself drifting toward something that feels like team strategy—if it seems that you and others are contemplating competing as a unit rather than as individuals, you are approaching the line. Pump the brakes. This is what we hope of our KBF TOP TEAM CHALLENGE CUP Teams. This is what we desire of club members that travel, lodge and launch together. This is what we expect of each competitor in the 2019 KBF National Championship. Work together to the extent that you don’t conspire, cooperate to the point that you don’t collude and represent to best community of anglers in the world with honesty and integrity. Good luck to the competitors participating in the KBF TOP TEAM CHALLENGE CUP, represent the brands supporting you with pride, represent them with your efforts and actions and the team with the sum of the best individual efforts for big fish over two days will be crowned CHAMPIONS.